I have a newfound crush on panna cotta. I see it all the time on cooking shows, and until quite recently, I simply could not understand why it was so popular. Pudding with a fancy name, I thought. Plus, panna cotta is a cream-based dessert, so it was clearly out of my lactose-intolerant bounds. This gorgeous version of panna cotta is great for special occasions, and you can serve it different ways as well (see serving options and notes at the bottom of the recipe.) Try it and report back to me whether it converted you, too. 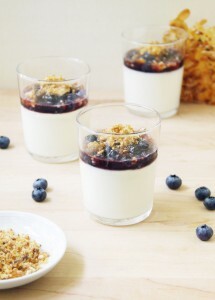 To make the almond panna cotta:Lightly grease 6 glasses, small bowl, or ramekins with a neutral-tasting oil. (If do not plan to unmold the panna cottas, you can skip this step). Measure ½ cup (125 ml) almond milk and pour into a large bowl. Sprinkle the gelatin over the cream and let rest about 5 minutes (don’t mix—this step allows the gelatin to bloom). Pour the rest of the almond milk (1½ cups (375 ml)) and the heavy cream in a saucepan. Mix in the sugar and the almond extract. Heat over medium heat until the sugar is dissolved and the mixture is piping hot (no need to simmer or boil). Pour the very hot almond milk mixture over the gelatin and whisk until the gelatin is completely dissolved. Divide between the prepared glasses, small bowls, or ramekins. Cover with plastic wrap and refrigerate at least two hours, or preferably a half-day. The panna cotta mixture can be prepared up to two days ahead. To make the salted praline: Line a large baking sheet with parchment paper. In a medium saucepan, heat the sugar and water over medium heat, stirring with a silicon spatula, until the sugar is completely melted. Bring to a full boil and cook, without stirring, carefully swirling the pan from time to time, until the caramel is deep golden. Working very quickly, remove from the heat, add the almonds, stir to incorporate, then spread the mixture onto the parchment paper-lined sheet to about ¼-inch (0.5 cm) thick. 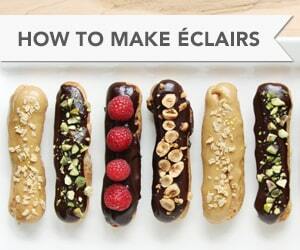 Generously sprinkle all over with fleur de sel or flaky sea salt. Let cool at room temperature (or in the fridge, if you’re in a rush) until the praline is set and hard, 15 to 30 minutes. Break the praline into pieces and store in an airtight container until ready to use. The praline will keep at room temperature for several days. 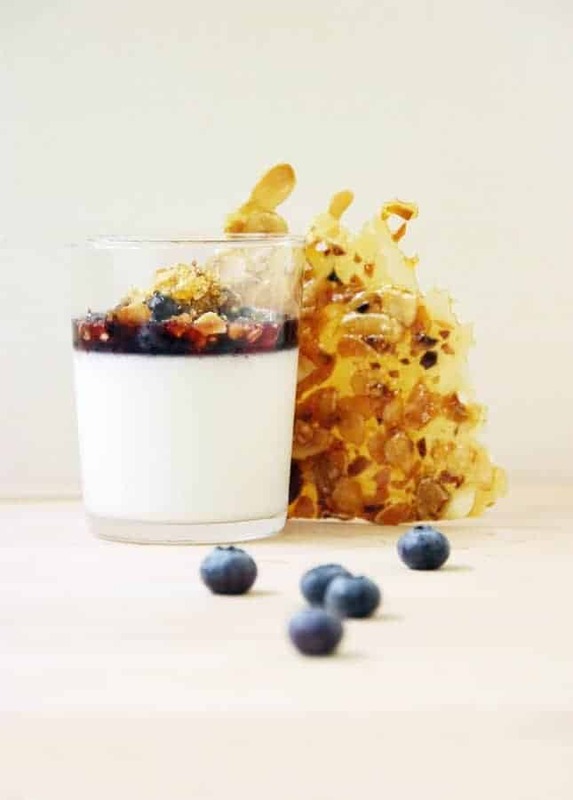 To make the macerated blueberries: In a small saucepan, combine the blueberries, water, and honey. Get to a boil then remove from the heat. Add the orange zest, stir, then transfer the mixture to a jar or a bowl. Let cool and macerate at room temperature for at least an hour. Refrigerate until ready to use (the macerated blueberries mixture should be cold before being served with the panna cotta). 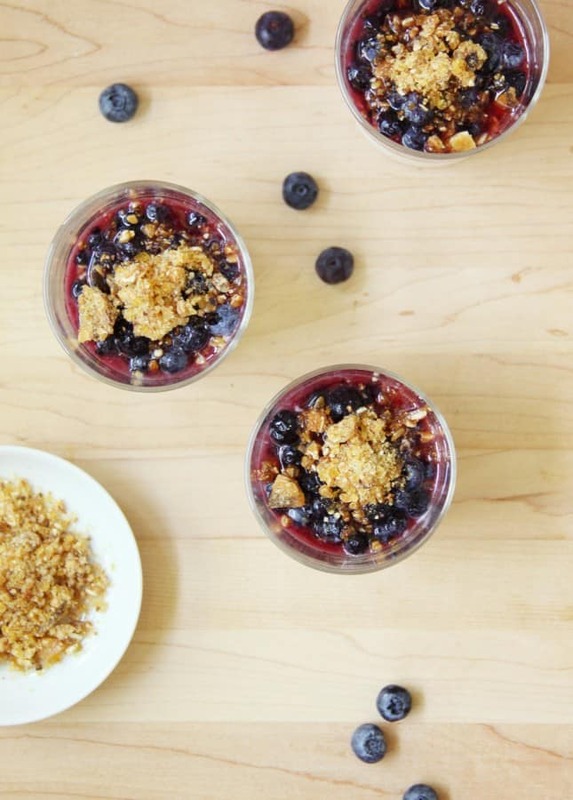 In the glass (or bowl, or ramekin): Divide the macerated blueberries between each serving. Top with shards of salted praline. Unmolded: Carefully slide a sharp knife all around the edge of each panna cotta, then reverse onto serving plates. Spoon some macerated blueberries over each serving and top with pieces of salted praline. This post was created in partnership with Almond Fresh. Almond Fresh is currently running a cool giveaway:Say how you like to use almond milk in your cooking on Twitter, Facebook, or Instagram using the hashtag #aNaturalFit and you could win one of four Vitamix Blenders! For details, see the contest’s rules and conditions. Thank you for supporting the sponsors that keep Food Nouveau running! For an extra special look and texture, coarsely blitz the salted praline in a food processor and spoon on each panna cotta right before service.